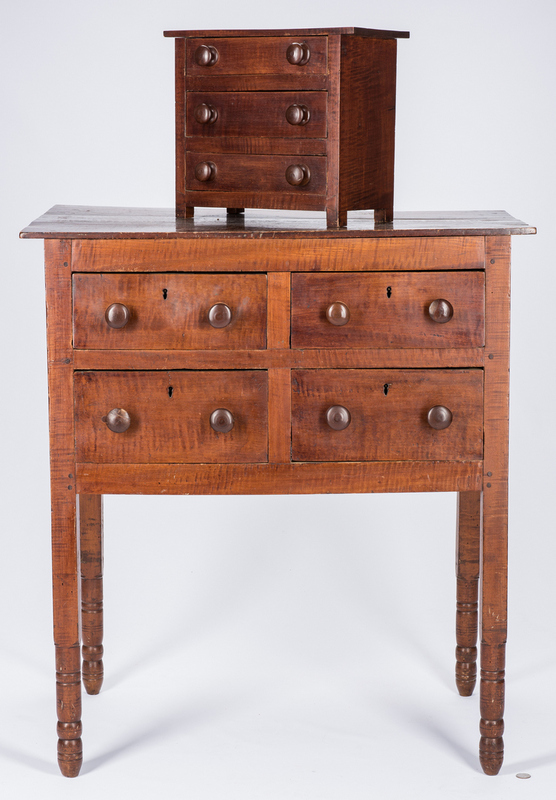 Two (2) Georgia furniture items, likely same maker. 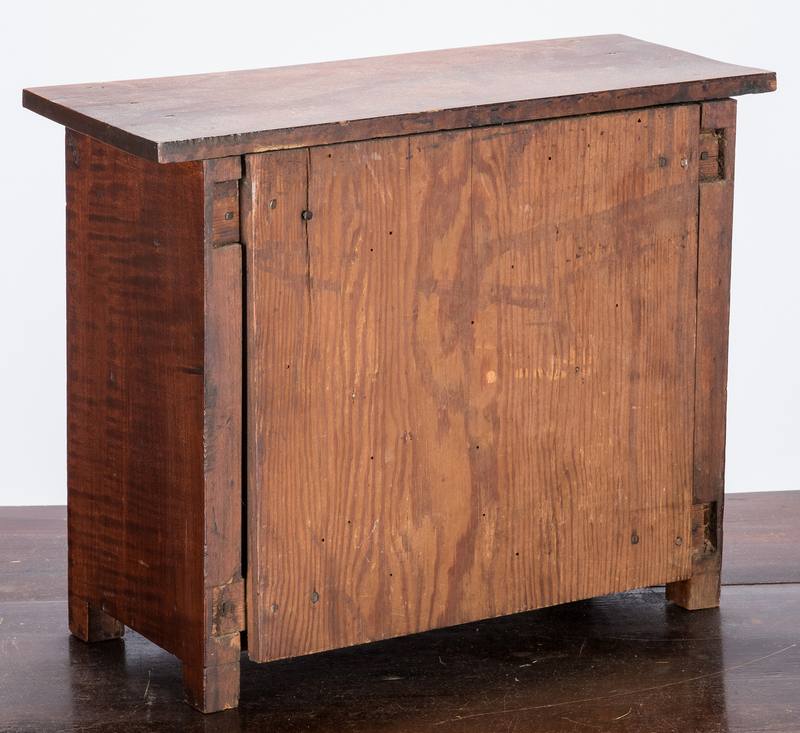 1st item: Georgia tiger maple server with yellow pine secondary wood. 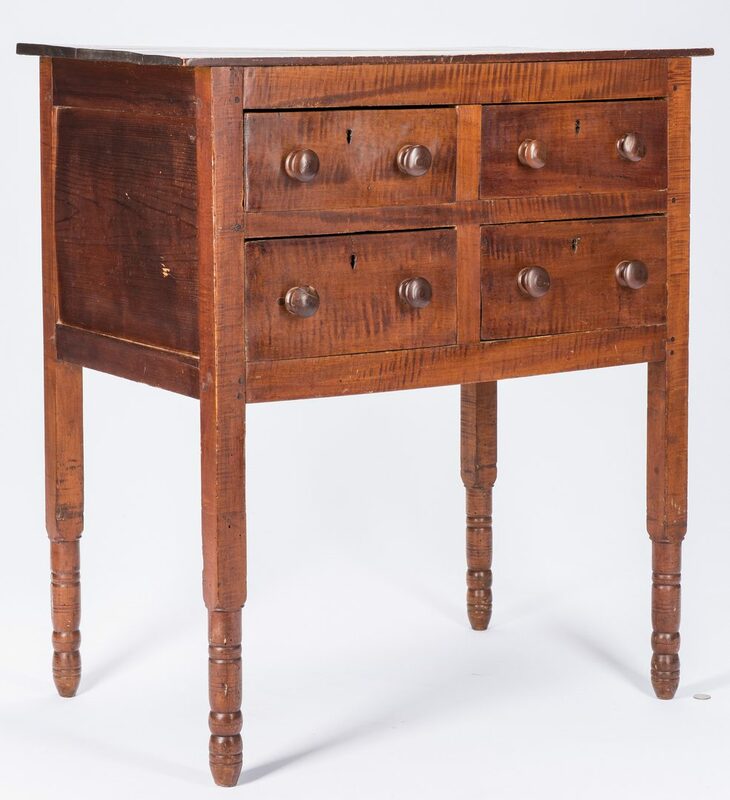 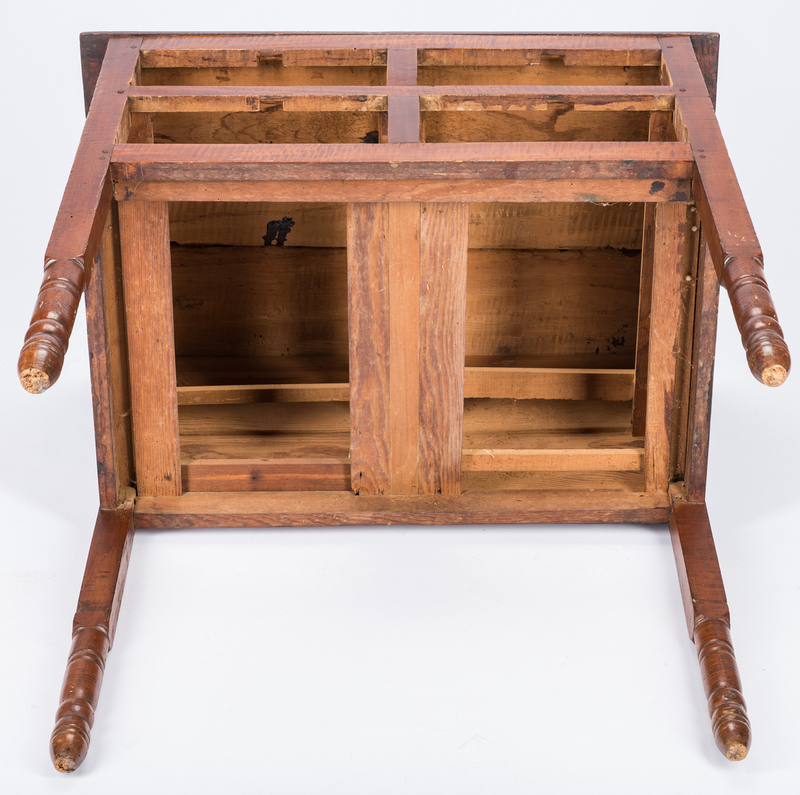 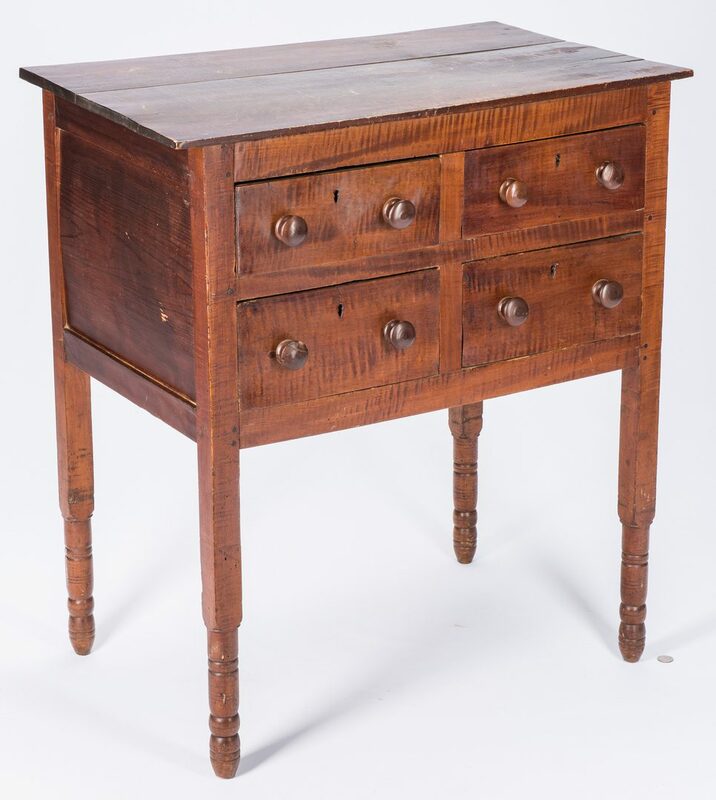 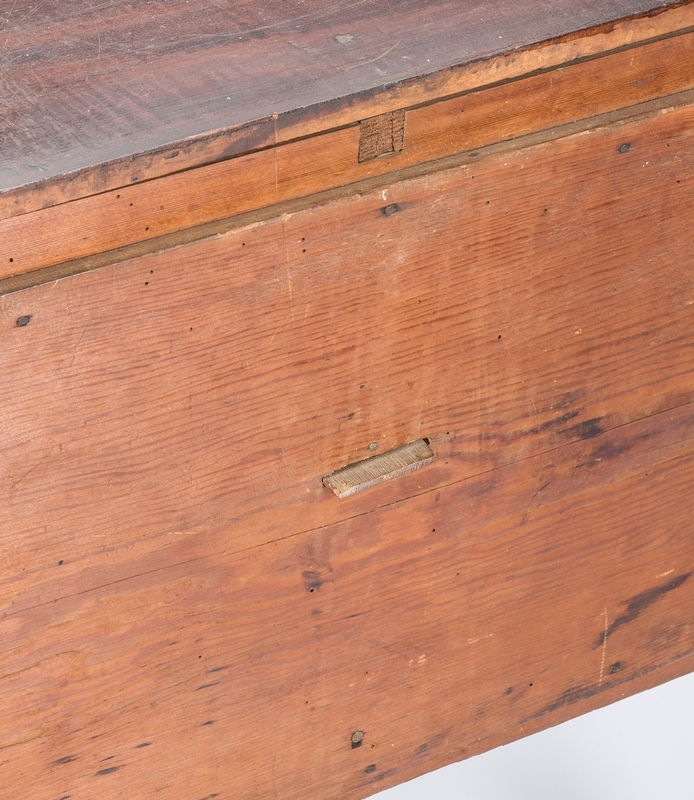 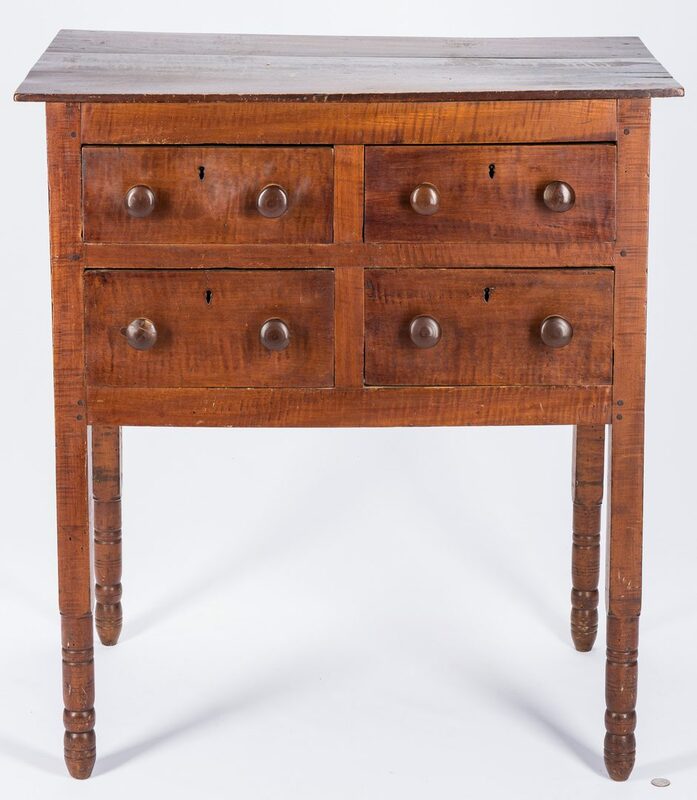 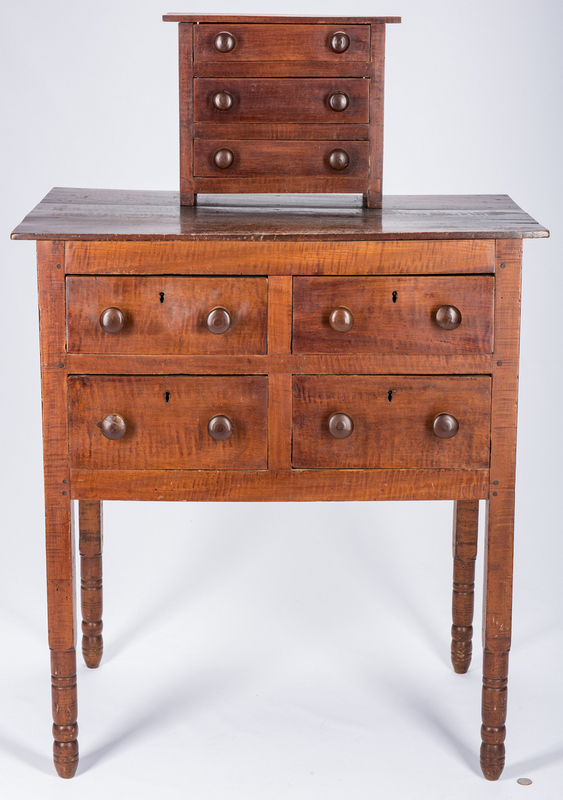 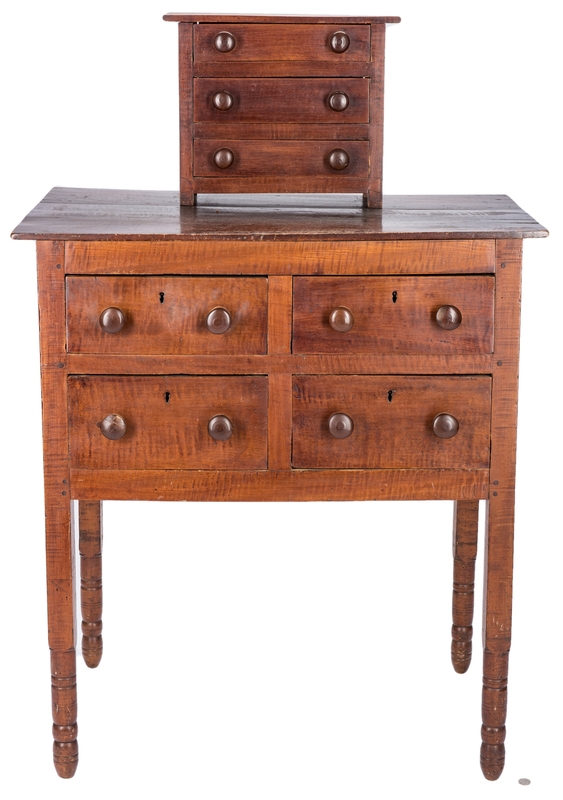 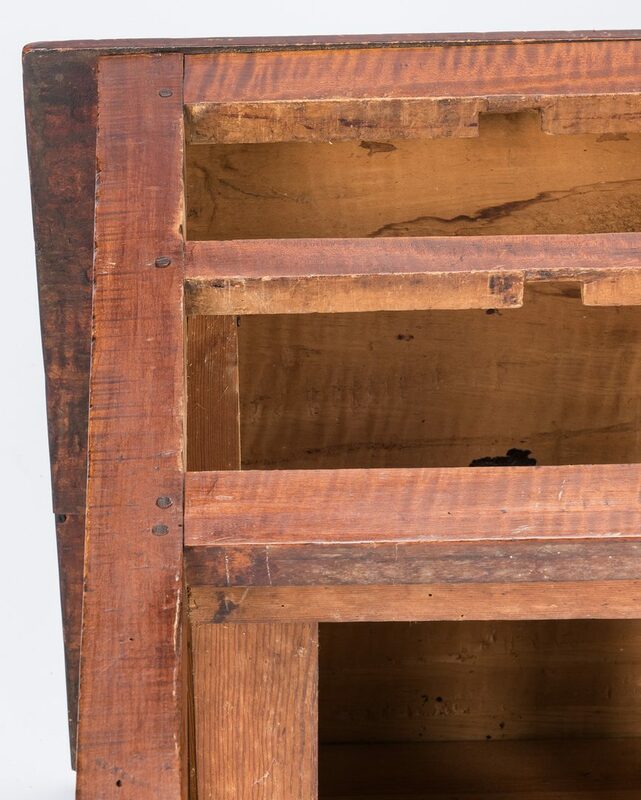 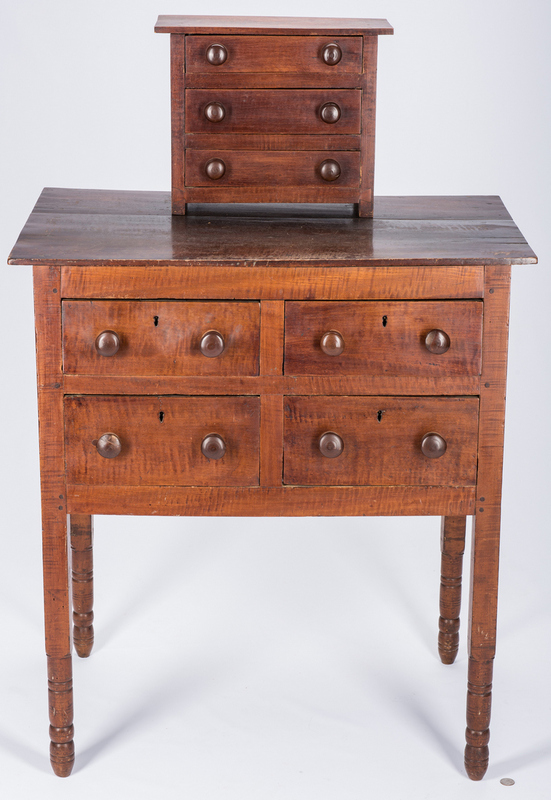 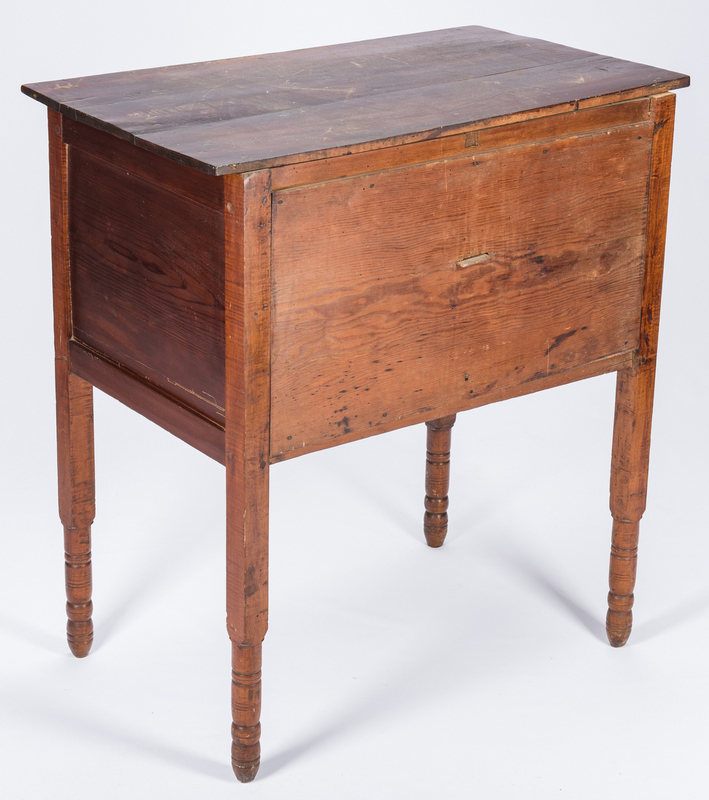 Comprised of an overhanging top; four drawers having square nail construction and unusual pegged wood pulls, two over two arrangement; and tall turned legs. 35" H x 31 7/8" W x 19" D. 2nd item: Signed Georgia maple and yellow pine miniature chest of drawers with overhanging top, three drawers having square nail construction and unusual pegged wood pulls, lower skirt dovetailed into the side stiles and terminating in straight feet. 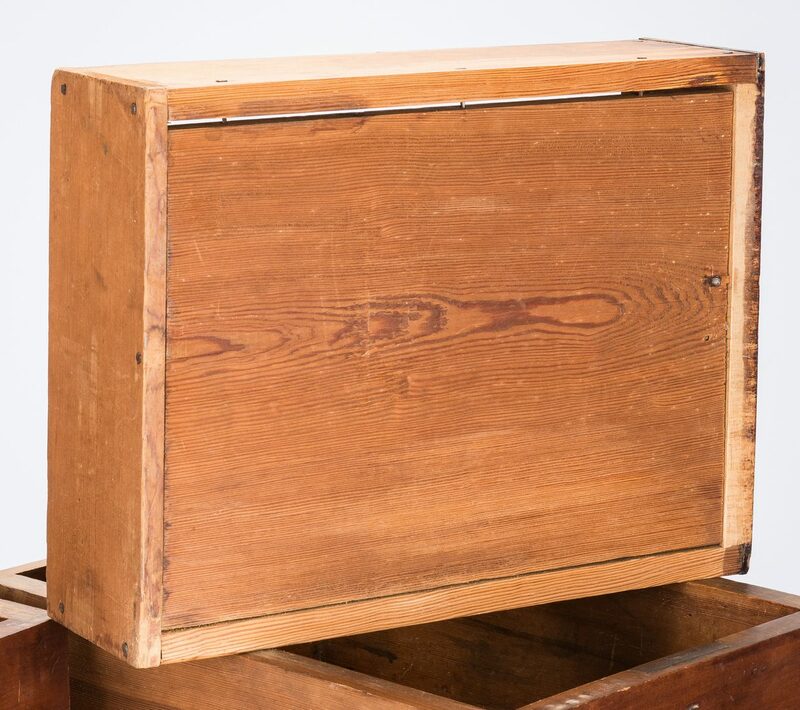 Back of second drawer signed in pencil "E. T. Johnson". 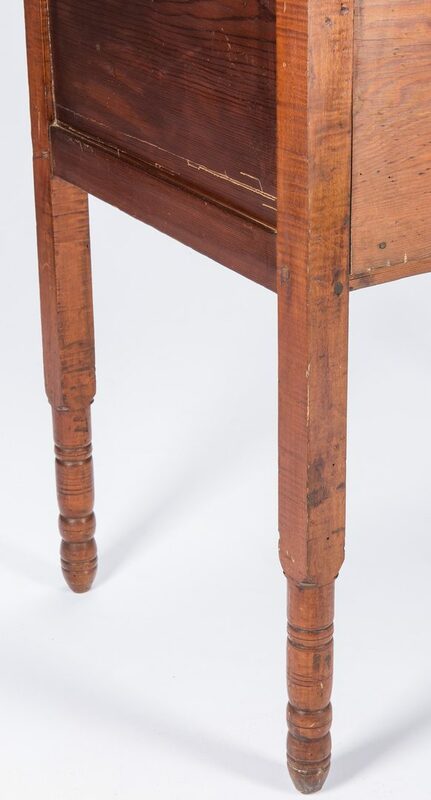 12 1/4" H x 15 1/2" W x 6 1/2" D. Both items mid to late 19th century. 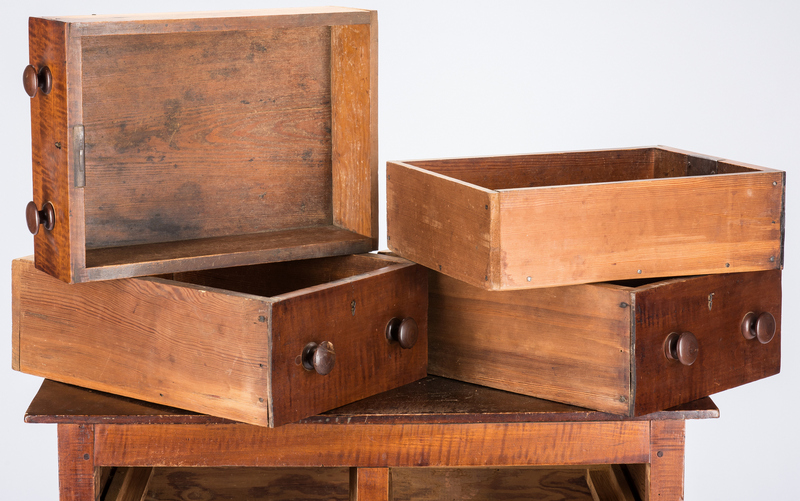 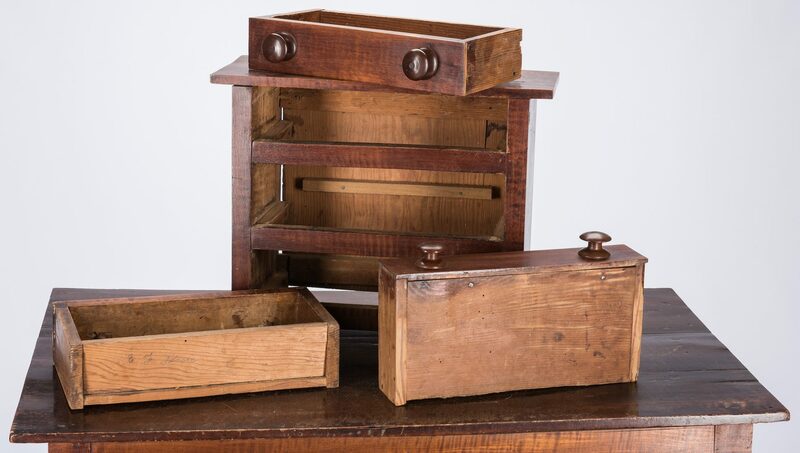 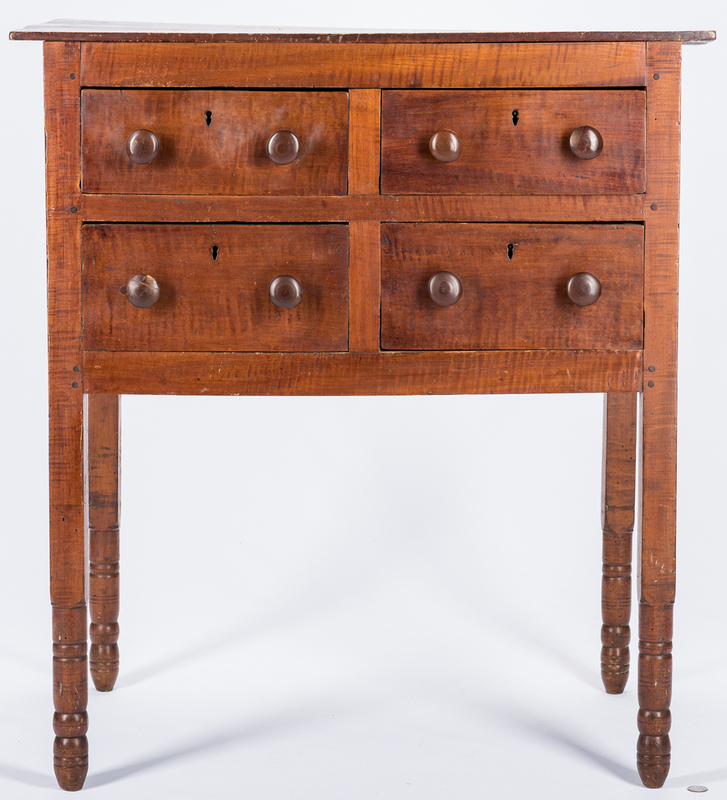 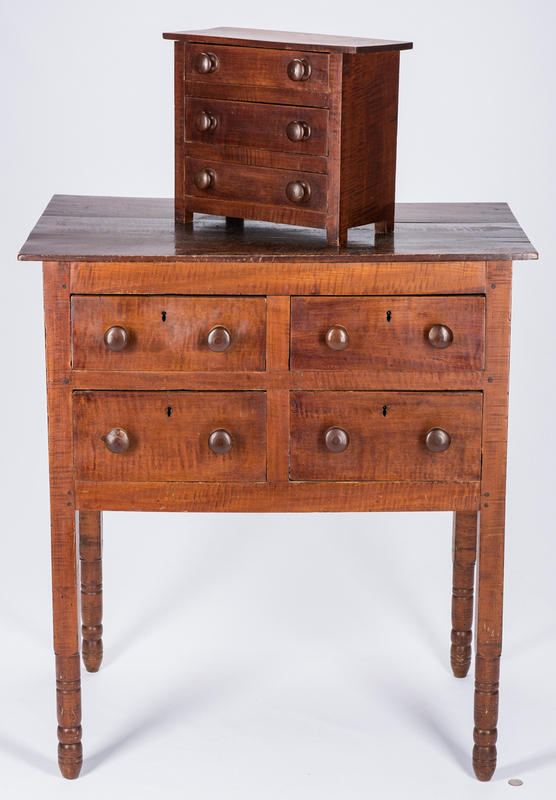 Note: Although the cabinetmaker of these pieces is unknown, they are likely by the same hand or shop due to shared construction characteristics, including the use of square nails and the unusual pegged wooden pulls. 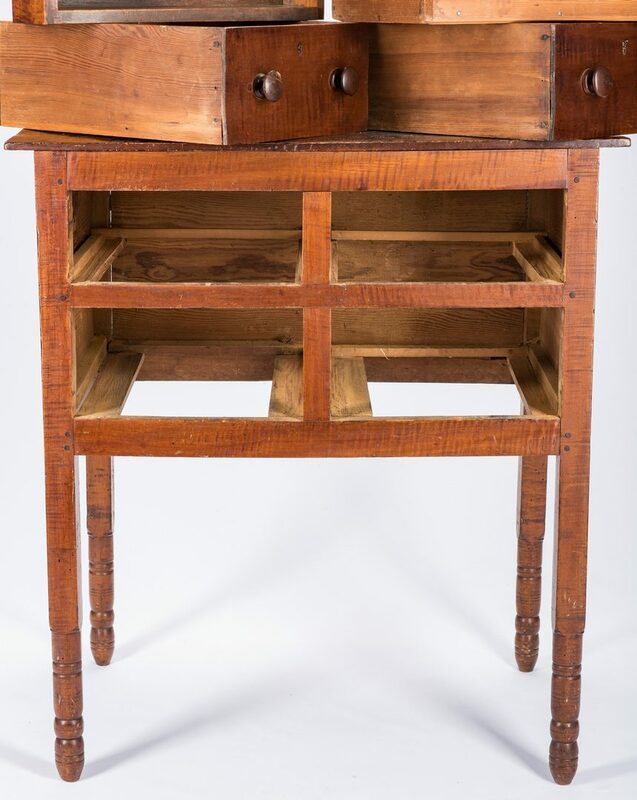 Provenance: Both descended in the family that owned Cheney Plantation, Marietta, GA. 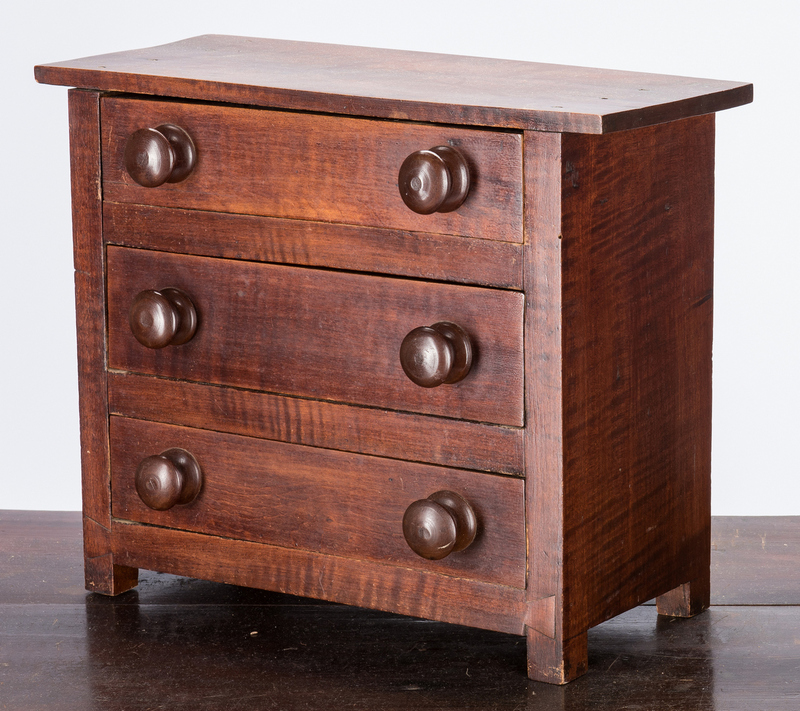 CONDITION: 1st item: Older refinish. 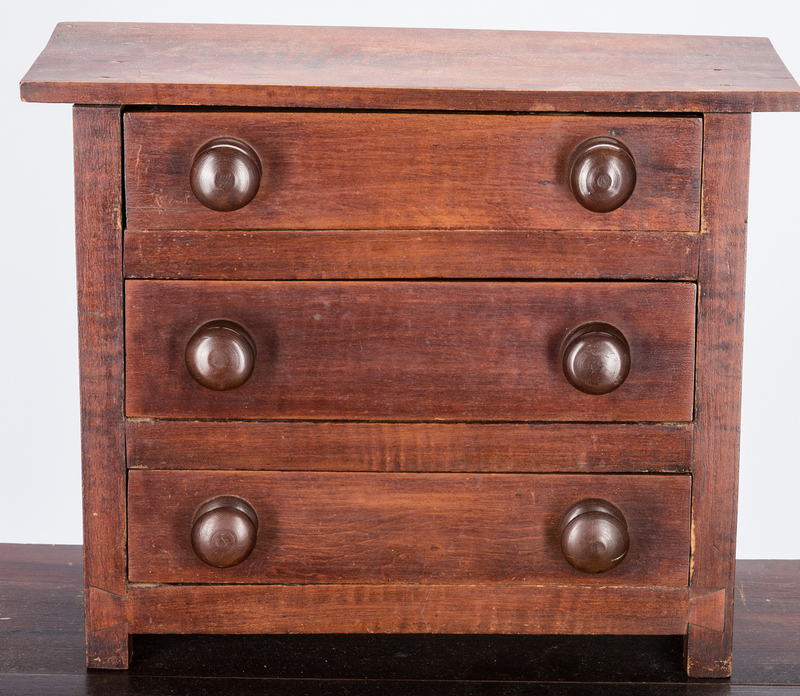 Top with light stains, scratching and abrasions. 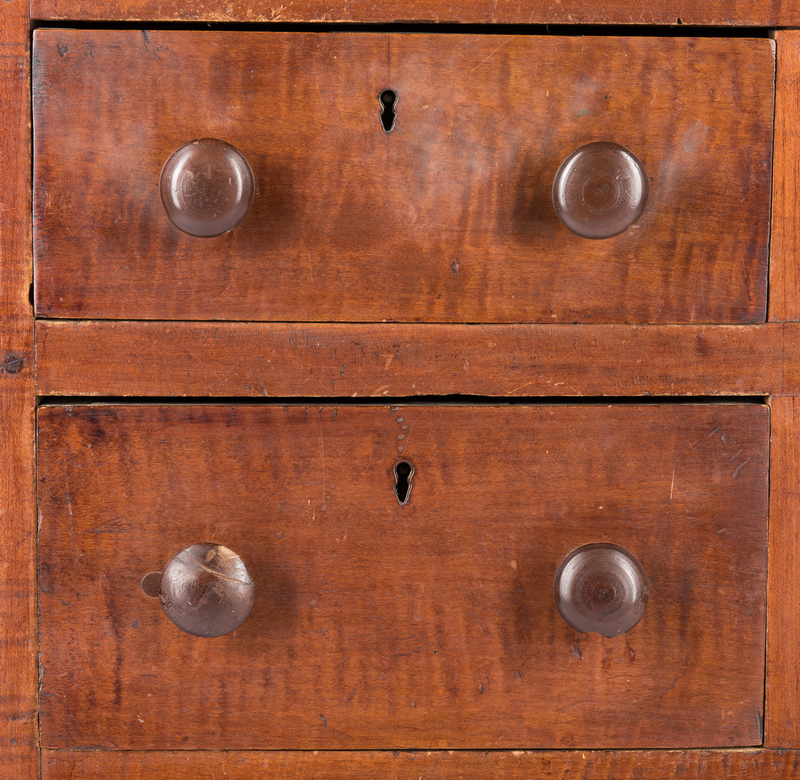 Damage to a couple of the wooden knobs. 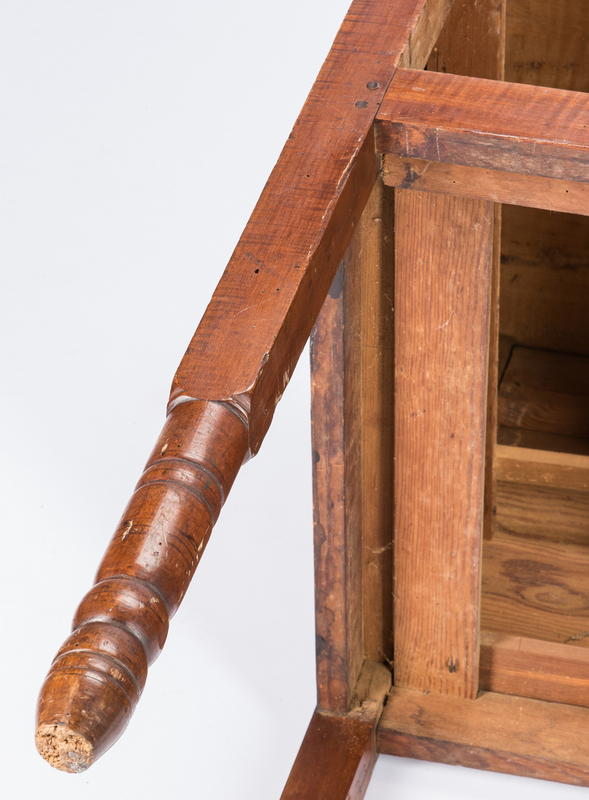 2nd item: Older refinish, some wear and light abrasions. 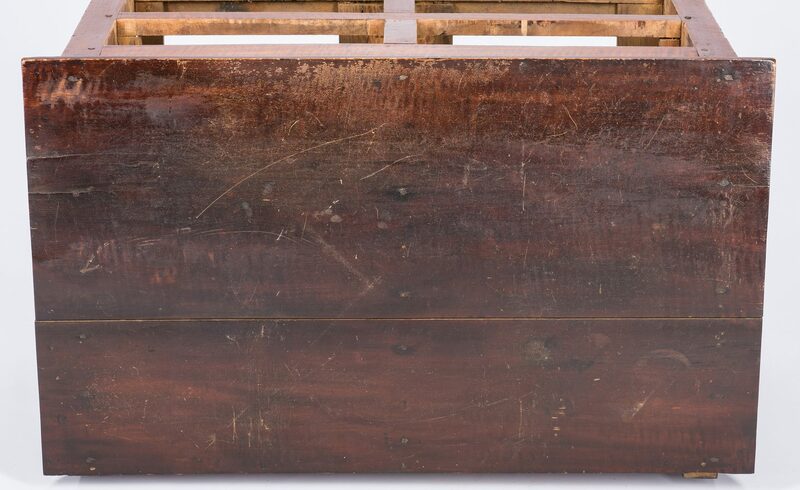 Age crack to left side of top drawer with abrasions to lower corners of case where top drawer rests.